Ask yourself: Is there anything on PERCEIVABLE our website that a blind, deaf, low vision, or color blind user would not be able to perceive? Ask yourself: Can users control OPERABLE interactive elements of our website? Does our website make completing tasks easy? Ask yourself: Is all of the text on our UNDERSTANDABLE website clearly written? Are all of the interactions easy to understand? Ask yourself: Does our website only ROBUST support the newest browsers or operating systems? Is our website developed with best practices? How do you resolve this? ● Make sure that any videos you have on your website are captioned properly. ● Hand-captioning is best, but automatic captioning is better than nothing at all. ● Transcripts and captions are different, both are important. How do you resolve this? ● Plan out heading and page structure — make sure it makes sense to readers using a mouse, keyboard, and touchscreen devices. ● Place important actions at the top or bottom of the page. ● Use skip links and don’t forget your focus indicators! How do you resolve this? ● Use an inclusive font in relative units. ● Make sure to add enough margins, padding, and line spacing to your text. ● Break text into small, readable units or use bullet points and numbers. How do you resolve this? ● Turn “Compose image descriptions” on in your Twitter account: https://twitter.com/settings/accessibility ● Follow @PleaseCaption on Twitter and they will yell at you when you mess up (because you will). ● Add context text to image posts on Facebook too. 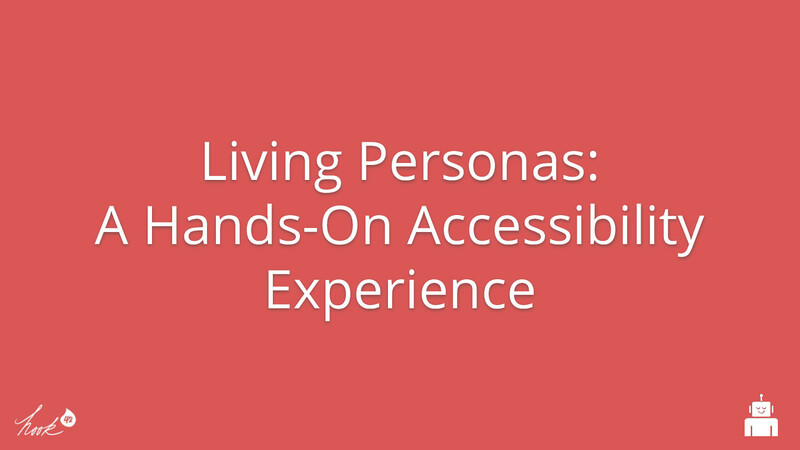 View Living Personas: A Hands-On Accessibility Experience on Notist. In this interactive experience, we will start off by talking about how people with disabilities use the internet and how we can make websites more inclusive. Once you’re briefed on the ABC’s of a11y, we’ll delve a little deeper into different personas within the disability community and how web accessibility relates to the specific needs within. You may even get a chance to join in! Whether you’re a seasoned accessibility pro or you’ve never heard of it before, technical or non-technical, you’ll be able to follow along, participate, and gain valuable new knowledge and insight about how to make your websites more inclusive. Helena puts presentations on for free. You can too. It was a really good presentation, the structure worked really well, kudos to Helena and @cariefisher.